Professionals, Students and Supporters: Become a Wildlife Partner Today! 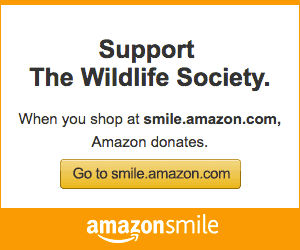 Click Here to Become a Wildlife Partner! If you aren’t a member of the parent organization of The Wildlife Society, but are a wildlife professional, student or supporter, don’t miss out on the opportunity to become a TWS Wildlife Partner at absolutely no cost to you. Two Wildlife Partners e-newsletters per month with content and announcements that will keep you informed about the latest wildlife news, research and management practices, as well as dates and locations of TWS Section, Chapter, and Student Chapter meetings and programs in your area that may be of interest to you. Action Alerts from the TWS Government Affairs team that not only keep you informed about wildlife policy issues that are important to you, but that also make it easy for you to share your comments with your government representatives so that our collective voice is stronger and more influential. Links to two recorded presentations per month from our most recent Annual Conference for professional and student career development, or to simply broaden and deepen your knowledge of important wildlife topics if you’re a wildlife supporter. Whether you’re currently not affiliated with TWS in any way, or are solely a member of one of our outstanding Sections, Chapters, or Student Chapters, we encourage you to join us as a TWS Wildlife Partner today. There are no hidden costs or obligations. Signing up is easy and only requires your name and email address so that we can deliver your benefits, and an indication of whether you are a wildlife professional, wildlife program student, or a wildlife supporter so that we can customize the information and benefits we provide to you. Why are we providing this free affiliation with The Wildlife Society? Because we know that there are hundreds of thousands of people who are passionate about wildlife science, management and conservation who can benefit from the information sharing and engagement that this program will provide. And together, our collective voice and actions will have an even greater impact. We believe that the more you and others know about the important work of The Wildlife Society and the professionals, students and supporters who are active members of the parent organization, the more you’ll want to become involved with us in a variety of efforts that are relevant and valuable to you and important to the future of wildlife conservation. If you’re already a member of the parent organization of The Wildlife Society, we thank you for your loyalty and support and ask that you invite everyone in your personal and professional network to become affiliated with our organization through this free offer. Become a Wildlife Partner today!